Serve up this hearty and total comfort food Beef Noodle Bake! Ground beef, tomato sauce, onions, sour cream, cottage cheese, and more come together one incredible dinner fit for any day of the week. Pair with a buttered dinner roll or a crisp green salad and you have a meal the whole family can rave about. What better way to spend an evening with family and friends than with a big heaping bowl of comfort food. This Beef Noodle Bake hits the spot. It’s hearty, filling and packed full of cheesy goodness. You’re going to want to make this recipe again and again. 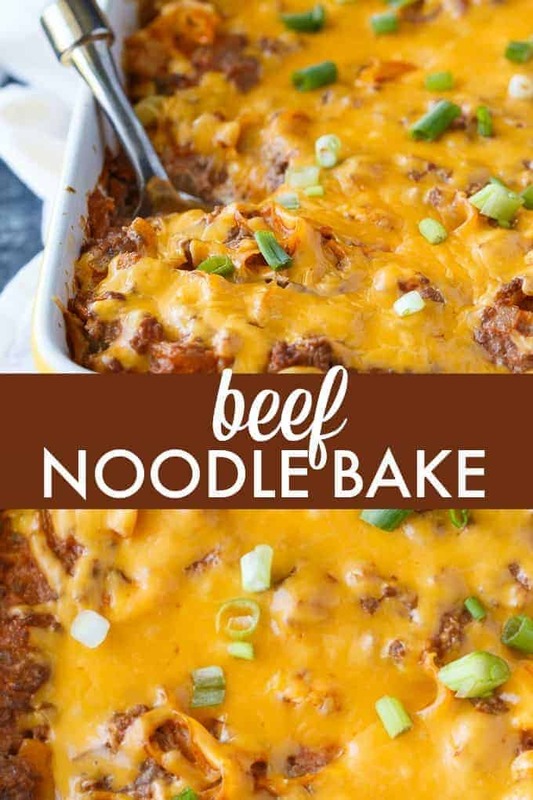 I have been making this Sour Cream Beef Noodle Bake for years. 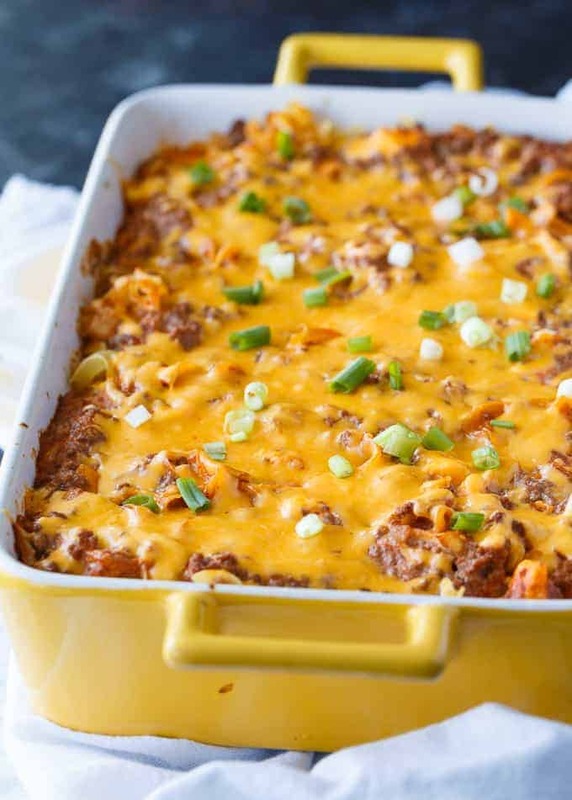 Casseroles are something I think anyone who spends time in the kitchen can agree on! They are incredible, easy to assemble, and you can kick your feet up and relax as it bakes to golden perfection. 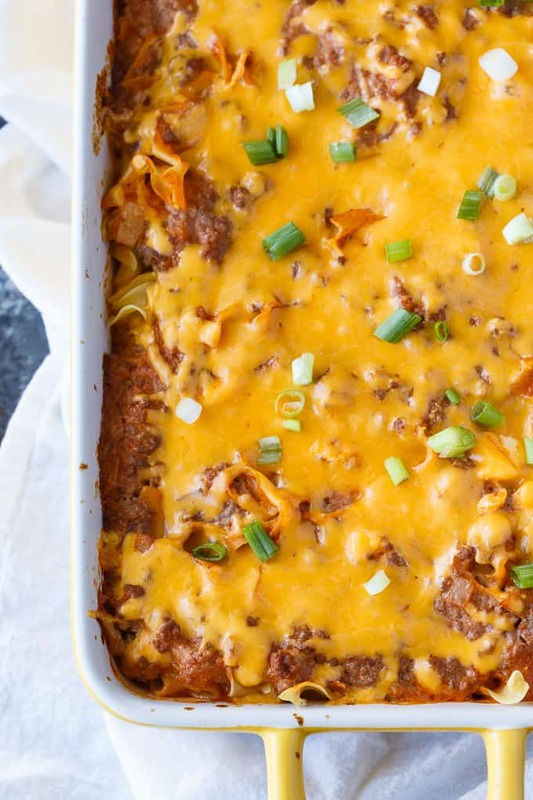 I love the Beef Noodle Bake for the layers of cheesiness. I use sour cream, cottage cheese, and then cheddar cheese to top it off. If you can’t tell, we love cheese in our home. 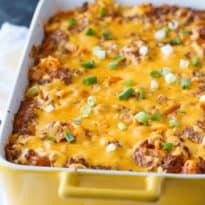 Best of all this recipe for the Sour Cream Noodle Bake assembles pretty quick so then all you have to wait on is the timer going off to pull it out of the oven. If you have some of this Beef Noodle Bake leftover, just put in an airtight container and store in the fridge. If you don’t have that place in a bowl and wrap tightly with plastic wrap or even aluminum foil. When you want to reheat place in microwave to reheat or if you’re going to be put in an oven-safe container, and wrap tightly with aluminum foil and heat at 350 degrees until warmed all the way through. The aluminum foil will help prevent the bake from drying out once it reheats. Because of the sour cream in the Beef Noodle Bake, it will separate and break down a bit in the freezing process. You will still get the same flavor, but it will offer a different texture. This dish is better served fresh or reheated from the refrigerator. If you do want to try freezing it, place in airtight container, wrap tightly in aluminum foil and freeze for up to 1-3 months. Then to serve, thaw in the fridge and then warm up in the oven at 350 degrees covered until heated through. Yes. You can do straight Italian sausage or even a half sausage and half ground beef mixture. Granted the name is beef noodle bake, but you can sub for Italian sausage. I am sure ground turkey and chicken would work as well, with a slight change in flavor, if you were looking for leaner meat to use. If you don’t have any egg noodles on hand or maybe aren’t a fan, reach for a regular pasta if you want. This will change the texture and flavor a bit, but it will work. Just grab your favorite pasta and cook it up according to the directions on package. Drain and set aside and just follow these instructions on when to put into the casserole. Start by preheating your oven and cooking your noodles to according to the package. You start cooking your beef and onions over medium-high heat. Once that is thoroughly cooked through remove from heat. Toss in other ingredients and pour into a greased 9×13 pan. Do layers of noodles and meat mixture, until you run out. Bake and then after 30 minutes top with cheese and bake a little bit more. You can make Beef Noodle Bake in advance. Just prepare your dish as directed, and then wrap up in plastic wrap or aluminum foil and place in the fridge. You can store this for a night if need be. Then add on 10-15 minutes extra since your casserole is chilled, and then bake as directed. This is an excellent way to prep ahead if you are having a large crowd and want to have a casserole handy. I have made it in the morning, so at night I just come home and toss in the oven. Give this super easy Beef Noodle Bake a try today. A comforting and savory dish that feeds a crowd. Hearty, filling and oh so cheesy! This comfort food recipe hits all the spots. Cook egg noodles according to package directions. Set aside. In a large skillet, cook ground beef and onions over medium high heat, stirring often, until beef is cooked and onions are softened. Remove from heat. Stir in tomato sauce, sour cream, cream cheese, sugar and garlic salt. Grease a 9×13 casserole dish. Spread half the noodles along the bottom. Top with half the beef mixture. Repeat layers. Bake for 30 minutes. Sprinkle with cheese. Bake for 5 minutes. Sprinkle with green onions. Serve hot. Comfo t food at it’s best! Thank you fo the ecipe! Glad to find recipe for something little different.we need some variety,badly. Mr.Furry does all the cooking and he’s needing some ideas.Of course I don’t know anything, only cooked for 6 plus people for years but he’ll take ideas from somebody else. This sounds pretty good to me but am loving basic plain fare. No fancy stuff for me. This is the perfect comfort food during the cold winter months. My husband would definitely approve of this meal! Can I make it a couple days ahead and freeze? If so how much longer do you think I would need to bake it for? Yes, I would recommend adding 45 minutes to the time if it goes in the oven frozen. Just check on it periodically.